I’ve alluded to it several times, but I finally finished over the weekend the toy workbench for my niece and nephew. Although it took much longer than expected (due to my sloth, mostly), I am unequivocally pleased with the result. 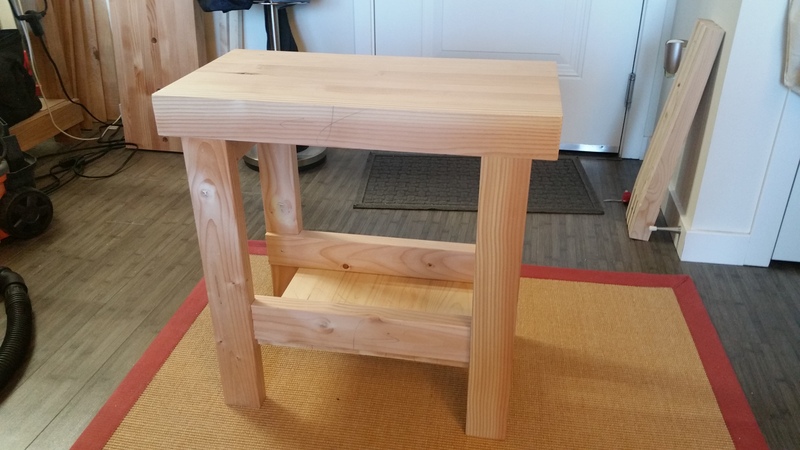 At 23.5″ long, by 12.5″ deep and 23.5″ high, the piece is not exactly in proportion to a full size workbench (which was the original goal), but nonetheless will serve its purpose. If anything, it’s a bit tall for my nephew currently, who should grow into it within the next year. In all its, ahem, unfinished glory. I expect my brother and sister-in-law will paint it. Right away, I knew this project was something special when the laminated benchtop came together so easily. I took great care to S3S each piece for the lamination, so it was a snap to glue up all nine pieces at once and then flatten the slab once the glue dried. I learned that lesson the hard way during the planing slab project. The legs are stub-tenoned and glued into the underside of the benchtop (drawbores felt a little extreme for a toy workbench). The side rails are flush (but not glued) to the underside of the benchtop and stub-tenoned and glued into the legs. The front and back stretchers are half-lapped to the legs and affixed with with glue and a single No. 10 wood screw. The shelf, which after much agonizing I glued and nailed to the underside of the stretchers (shortcuts do make sense, sometimes), is off-cut pine siding (rather than Douglas Fir), planed S3S. All in all, the toy workbench weighs about 40 lbs. 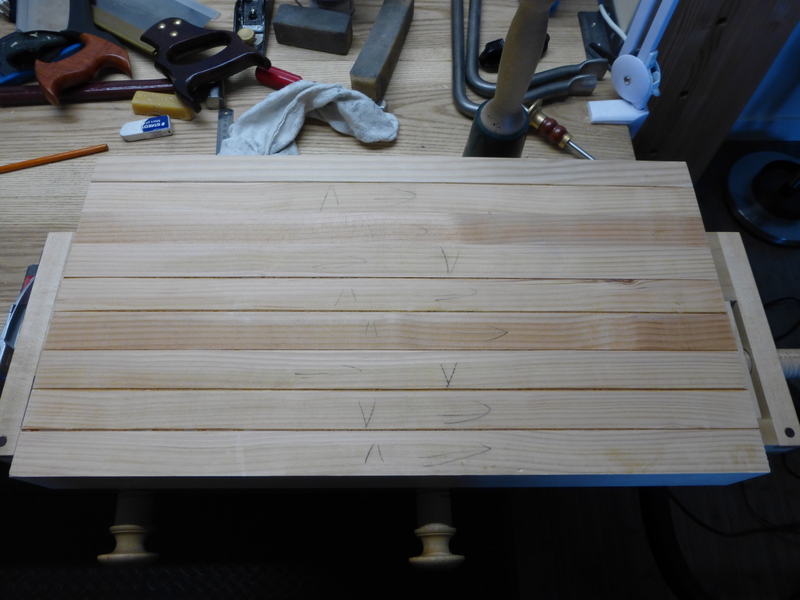 It would have been heavier, but I lost some thickness on the benchtop slab on account of chopping mortises on the wrong side. I would be greatly surprised if it’s not still around for my grand-nieces and grand-nephews. And now I have some practice for when I make the real thing.